FCIT. "Phillis Wheatley author page." Lit2Go ETC. Web. 21 April 2019. 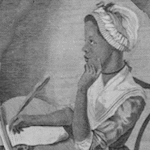 <https://etc.usf.edu/lit2go/authors/134/phillis-wheatley/>. FCIT, "Phillis Wheatley author page." Accessed April 21, 2019. https://etc.usf.edu/lit2go/authors/134/phillis-wheatley/.